Employee Assistance Programs Blog: America's First and #1 EAP Blog*: Reducing Absenteeism: Yeah, EAPs Do That Dummy! Reducing Absenteeism: Yeah, EAPs Do That Dummy! There is a old threat to productivity rearing its ugly head in a new way - absenteeism. Before you say, "no kidding, Dan! 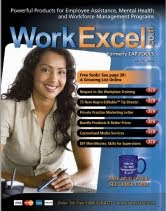 ", get this: The Washiongton Business Group Health ten years ago released a report, "Staying at Work" Report. It said, "properly targeted and executed disability and absence management programs can, in fact, produce real gains." They cite approaches that fail to mention EAPs in any way. I just do not understand this! The ongoing interest in absenteeism problems stems from a survey conducted showing 78% of human resource managers believe the main cause of absenteeism is a belief that those who skip out of work believe they are entitled to time off. This is extremely interesting. The second most cited reason was a lack of supervisor involvement as a catalyst to discourage worker absenteeism. This has EAP solutions written all over it. There is no way to discover the occurrence rate of personal problems to the degree that they affect absenteeism through a survey of human resource managers like the one conducted by this Blue Ribbon group. 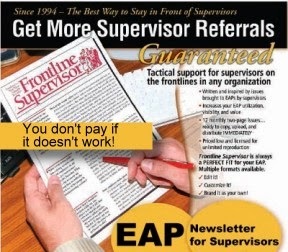 Superimpose this fact on top of the empirically-based research paid for by EAPA members dues and conducted by Linda LaScola Research sometime around 1992-3?, which found that human resource managers don't know how to use EAPs efficiently, and you got yourself a real case for EAPs coming to the rescue. What to do: Help spearhead an absenteeism management program that puts the EAP front and center. Consider new training, and ask the organization to give you access to their absenteeism report. Watch your EAP utilization spurt up. Let me know if they blow you off. I would love to know why. "EAPs don't do that" might be the key reason -- like they know what EAPs do better than you do! I have seen this a million times. You open your mouth at meeting, and someone says, "EAPs don't do that". Where does this stuff come from? 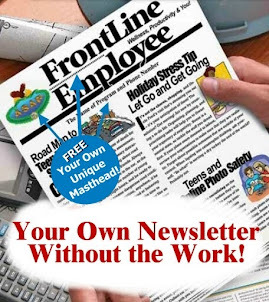 Do you have a newsletter for employees? If you do not, let prove something to you. You're utilization rate will go up 20% annualized with a monthly EAP newsletter (2 pages--never four!) or if it does not, I will publicly apologize in this blog at the end of a free three month trial. So, let me send you a free trial. Don't worry, I will not chase you down waving a bill at you. Go here for it. Labels: EAP, eap cost-benefits, EAPs, employee assistance services.